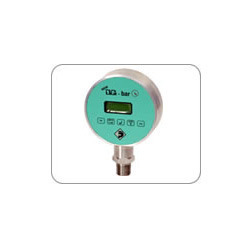 Pioneers in the industry, we offer digital temperature gauge and digital pressure gauge from India. We bring forth the best Digital Temperature Gauge (Model 877) for our valued clients. These products are ideal instrument for providing on site digital readings for temperature signals. The digital gauge has two parts. One is the temperature sensing element being standard RTD 3 wire or a Thermocouple type. 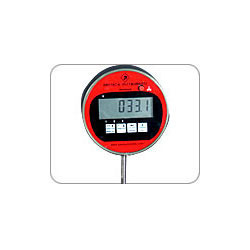 These products have a 4/5 digit numeric LCD display, that display temperature value accurately. Model 877 series is suited for low drain, battery operated systems. An internal rechargeable 9V DC battery ensure longer functional life. The high grade power efficient microprocessor chips, and software features like auto sleep ensure one year battery life (in ideal conditions). The model is a fully configurable one, microprocessor based type. The model includes low drift operational amplifiers and industrial grade components. Long trouble free operation is ensured by burn in of each module. The gauge is normally available in standard 6”/8” diameter high grade alloy enclosures. Cold Junction Compensation Built in for T/C input. We are offering our valued clients an impeccable Digital Pressure Gauge (Model 876). These products are is ideal instrument for measurement of pneumatic pressures or vacuums. An integrated numeric/alphanumeric LCD structure display the same to the resolution of full 5/6 digits. Provided high grade electronics and algorithms make this instrument to be used as a master gauge, thus facilitating calibrate any other gauge (hydraulic or pneumatic) in its respective range, with the condition that the range to be calibrated should be within the maximum range of manometer. Conversion table can be provided, which can convert digital display from one unit to an equivalent digital display of another unit like display of 5000mm h2o can be converted to 5kg/cm2 by pressing just one key and so on. The gauge is supplied in a head mount weatherproof or explosion proof housing. The unit gets powered up by internal rechargeable 9 V DC battery, and a battery charger will be provided with the unit for battery charging. The modules includes pressure input integrated circuit (USA make), low drift integrated circuits and industrial grade components. Burn in of each module ensures a long trouble free operation. Security Single level password protected. Looking for Digital Gauges ?